This beginners tutorial will introduce Galaxy's interface, tool use, histories, and get new users of the Genomics Virtual Laboratory up and running. You can follow this tutorial with the Galaxy Workflows tutorial to learn about workflows. Galaxy is an open source, web-based platform for accessible, reproducible, and transparent computational biomedical research. It allows users without programming experience to easily specify parameters and run individual tools as well as larger workflows. It also captures run information so that any user can repeat and understand a complete computational analysis. Finally, it allows users to share and publish analyses via the web. login to a Galaxy server. A file on a remote datastore with an accessible URL. This is a hands-on workshop and attendees should bring their own laptops. Galaxy is a web based analysis and workflow platform designed for biologists to analyse their own data. It comes with most of the popular bioinformatics tools already installed and ready for use. There are many Galaxy servers around the world and some are tailored with specific toolsets and reference data for analysis of human genomics, microbial genomics, proteomics etc. There are some introductory slides available here. Basically, the Galaxy interface is separated into 3 parts. 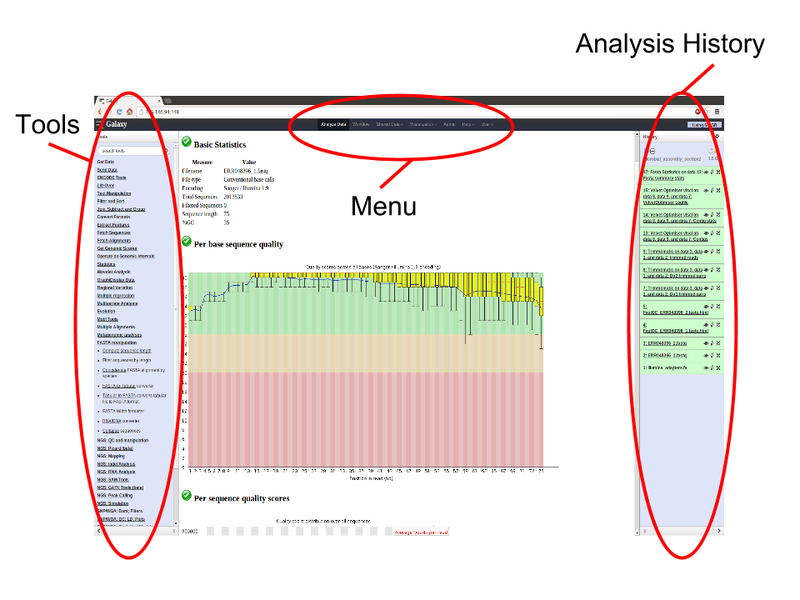 The tool list on the left, the viewing pane in the middle and the analysis and data history on the right. We will be looking at all 3 parts in this tutorial. The purpose of this section is to get you to log in to the server. Open your browser. We recommend Firefox or Chrome (please don't use Internet Explorer or Safari). Go to the Galaxy Australia server. Alternatively, you can use a different Galaxy server - a list of available servers is here. If you haven’t registered on this server, you’ll need to now. There are 2 main ways to get your data into Galaxy. We will use each of these methods for 3 files and then use those 3 files for the rest of the workshop. Click on the history menu button (the icon) at the top of the Histories panel. It is important to note that Galaxy has the concept of "File Type" built in. This means that each file stored needs to have its type described to Galaxy as it is being made available. Examples of file types are: text, fasta, fastq, vcf, GFF, Genbank, tabular etc. We will tell Galaxy what type of file each one is as we upload it. The file will now upload to your current history. If a file exists on a web resource somewhere and you know its URL (Unique resource location - a web address) you can directly load it into Galaxy. Note that Galaxy is smart enough to recognize that this is a compressed file and so it will uncompress it as it loads it. Now we are going to get another file from a shared Data Library. Go to the menu at the top of the screen and click Shared Data -> Data Libraries. Click on the Library: "Galaxy Australia Training Material" then "Galaxy_101"
Then click the "To History" button at the top of the page and select "As Datasets"
Finally, click "Analyse Data" in the menu at the top of the screen to return to your history. The DNA sequence of Staphlococcus aureus MRSA252 will be loaded into your history as a fasta file. Your history should now look like this. Though we aren't going to focus on the contents of these files and what they mean from a bioinformatics standpoint, here is a brief description of each one. The columns contain a lot of information but the ones we will be using indicate the amount of data (or coverage) that went into making up each piece of the final assembly. This file contains sequence reads as they would come off an Illumina sequencing machine. They are in fastq format. This file contains the genome sequence of Staphylococcus aureus MRSA252. It is in fasta format. The purpose of this section is to get you used to using the available tools in Galaxy and point out some of the more basic manipulation tools. Now that’s better. There was a lot of other functionality hidden behind that edit ( ) icon. You can change a file’s data type, convert its format and many other things. Feel free to play around with them at a later date. Ok, back to the tools. The first thing we are going to do is produce a histogram of contig read coverage depths and calculate the summary statistics from the Contig_stats.txt file. To do this we need to cut out a couple of columns, remove a line and then produce a histogram. This will introduce some of the text manipulation tools. 1. Cut out column 1 and column 6. Examine the new file by clicking on its icon. We now have 2 columns instead of the 18 in the original file. 2. Remove the Header lines of the new file. Note the the new file is the same as the previous one without the header line. Click on the icon of the histogram to have a look at it. Note there are a few peaks. Maybe these correspond to single, double and triple copy number of these contigs. 4. Calculate summary statistics for contig coverage depth. This shows how to convert a fastq file to a fasta file. The tool creates a new file with the converted data. This will have created a new Fasta file called FASTQ to FASTA on data 2. This example shows how to use a tool called “barrnap” to search for rRNAs in a DNA sequence. Now let's say you only want the lines of the file for the 23S rRNA annotations. We can do this using a Filter tool. Now you have a gff3 file with just the 23S annotations! Remember how we started a new history at the beginning? If you want to see any of your old histories, click on the history menu button at the top of the histories panel and then select “Saved Histories.” This will give you a list of all the histories you have worked on in this Galaxy server.